A book in four colors by Fabrice Dini with a preface by Matthieu Ricard. Illustrations Emanuele Scanziani. The author will introduce you to the new trends shaping the future of education: mindfulness, emotional intelligence, positive psychology, outdoor pedagogy, ethics, soft skills, fundamental qualities of being human in education, etc. Approaches used in Switzerland but also in tens of thousands of schools, in the most prestigious universities, by top athletes, memory world champions, etc. are all tools that can be explored by parents and teachers. The author of the book and the preface writer are on the same page: children and adults have within themselves a tremendous potential that is, in most cases, under-utilized. A book by Fabrice Dini – with a preface by Matthieu Ricard. The author will introduce you to the new trends shaping the future of education: mindfulness, emotional intelligence, positive psychology, outdoor pedagogy, ethics, soft skills, fundamental qualities of being human in education, etc. Approaches used in Switzerland but also in tens of thousands of schools, in the most prestigious universities, by top athletes, memory world champions, etc. are all tools that can be explored by parents and teachers. In his preface, the spokesman for the Dalai Lama affirms his interest in integral education*. He says: “It’s high time that these concepts be integrated into the world of education and considered as indispensable components of education.” The author of the book and the preface writer are on the same page: children and adults have within themselves a tremendous potential that is, in most cases, under-utilized. Are you a parent or teacher and do you want to inspire movements that shape the future of education? 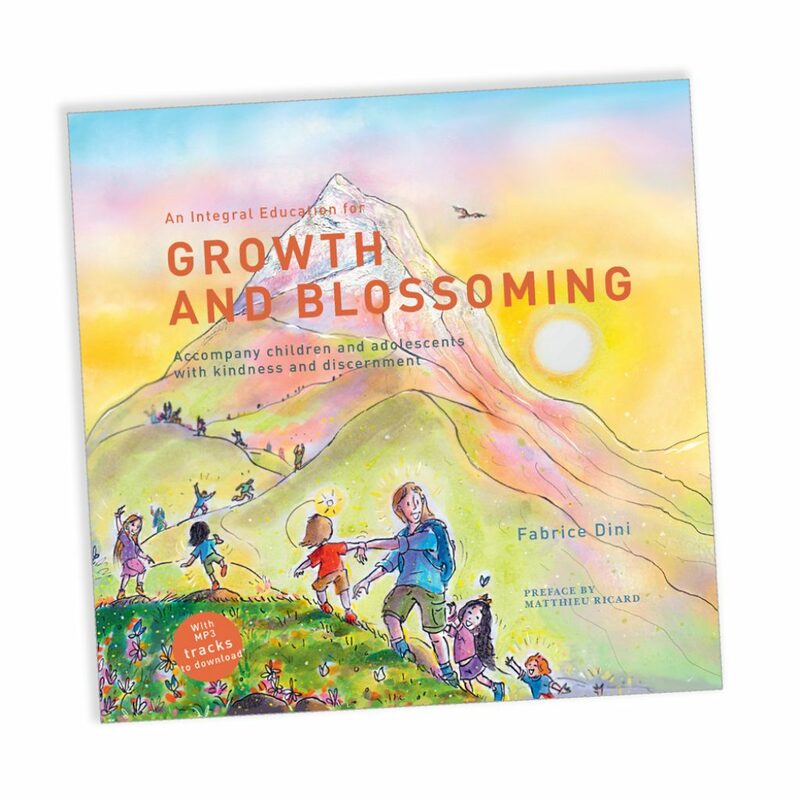 Are you looking for concrete activities and exercises to help children or adolescents better manage their difficulties and to create harmonious moments in school or at home? “Some essential works are supported and nourished by the life experience of their author. Integral Education for ‘Growth and blossoming’ is one of them. Fabrice Dini transmits the fruit of his research carried out in India for more than twenty years to all those who wish to develop an interior education for the twenty-first century. A path of rejuvenating and inspiring practices for children and adolescents.” Marine Locatelli, author and scriptwriter for cartoon heroes: Kirikou, Papyrus, T’choupi and Doudou, Boule & Bill, Kitou, etc.